Ever wondered how much your phone cost to make? 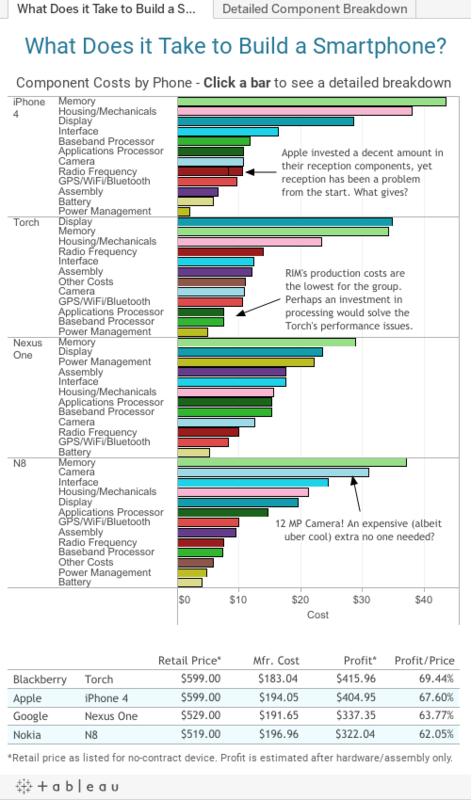 Wonder no longer with our interactive view of component costs by smart phone. Click a bar to link off to more detail. Please keep in mind that the estimated profit numbers at the bottom are for manufacturing costs only. What Does it Take to Build a Smartphone? This viz tells a couple stories. Apple spent more on the housing for the iPhone than any other manufacturer spent on ANY other component. Obviously, that has paid dividends. Blackberry spent significantly less than any manufacturer on the processor in the Torch, which is why it is so comparatively slow. Nokia, for some reason, deemed it necessary to use a $31, 12 MP camera for the N8- which may explain why it is not as strong in other areas.